The author coordinates North Carolina State’s Amazing Grazing Program and has his own cattle operation in Roxboro, N.C. Many producers do not appreciate the value of grass until they do not have enough during periods of drought or while feeding through winter. Numerous studies have evaluated the cost of grazing versus feeding hay or other stored forages; in most cases, extending the grazing season is profitable. Farmers will spend large sums of money to harvest, store, and feed hay. In most cases, they would not consider giving cattle full access to stored supplies. Why not do the same when utilizing your pastures? The first step to changing any production practice is the most difficult and that is why it comes about slowly. Some folks will decide they are tired of putting up hay all summer and feeding it all winter. Others will want to manage their grazing systems to improve soil health. Regardless of the circumstances, this decision will serve as a catalyst for change and lead to another level of management intensity. Many graziers use temporary fence to strip graze stockpiled tall fescue, which provides their livestock with superior nutrition at a lower cost compared to hay feeding. Strip grazing stockpiled fall forage growth is a great place to start adaptive grazing management. Subdividing large pastures with temporary fence can offer solutions on the quest for improved efficiency. While some have adopted this management strategy, many producers are reluctant to make the change. Below we will review some of the proven steps needed to successfully implement the use of temporary fence for improved pasture utilization. Keep it simple: Too often producers are overwhelmed by the complexity of some grazing systems. They read and/or attend grazing workshops and discover graziers who have a multitude of paddocks and frequently move livestock to fresh forage. However, most producers do not start with sophisticated systems, and in many cases only a few temporary subdivisions could yield improvements. Moving cattle once weekly can offer major advantages over not rotating livestock at all. Keep it simple and use temporary fence to divide existing pastures in half, allowing livestock to graze one section and then the other. This will be a good start and enables the livestock and people to become familiar with the new approach. Get educated: Most every management change requires learning something new. Producers will want to inventory the type of forage they have and how it can be used to nourish their livestock. Fortunately, there are numerous materials, workshops, grazing schools, and fellow producers to help the fledgling grazier. Remember, all grazing systems are unique, and graziers must adapt the information they gather to their farm. Trying to transplant a successful grazing system from one farm to another can often lead to disappointment. Even if the soils, forages, and livestock are the same, other factors could be much different. One farm may have full-time labor while the other must complete most of the work on nights and weekends. Don’t forget the “human factor” in a grazing plan. Don’t bargain hunt: It is important to resist the temptation to buy the lowest price temporary fencing tools. While this may seem like a good approach, the low price can come with low quality and a short productive life. 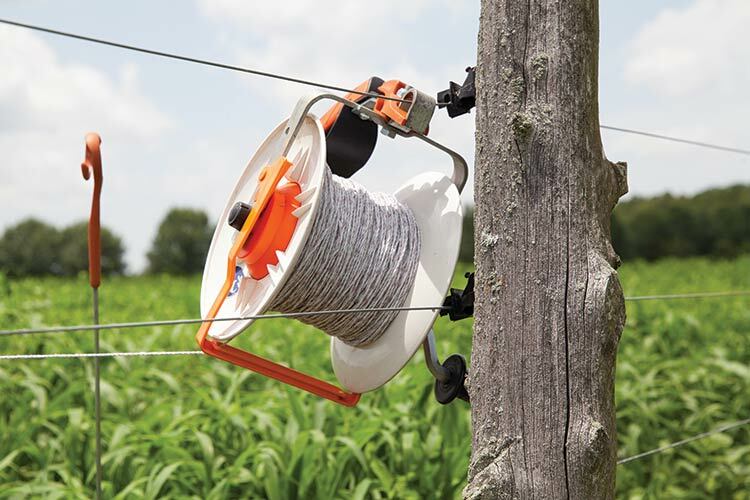 Good-quality polywire, reels, and posts will reduce frustration and provide good livestock control. Talk to more experienced graziers to help identify the best products and their availability. Fencing equipment is similar to trucks in that each producer will have their preference. Trying a limited quantity of different products will help to find the best tools for a given farm. More power: Improved electric fence technology has made it a popular choice for permanent perimeter and interior fencing. Permanent electric fence makes the addition of temporary fencing much easier. However, connecting temporary fence to an existing system will boost the workload for the energizer; this is referred to as resistance. Thus, as more temporary fence is used, a more powerful energizer may be needed to control livestock. A fence compass or voltmeter can assist with measuring fence performance, and the output will be measured in volts or kilovolts. The minimum charge required to control livestock under good conditions (few shorts and minimal vegetation) is 5 kilovolts for cattle and 7 kilovolts for sheep or goats. Energizer sizes are measured in joules and this would be similar to the horsepower rating on tractors. Choosing the correct energizer for the job is vital, and experience has shown that 1 joule for 10 to 40 fenced acres is a good starting point. Smaller farms could use a 2- to 3-joule unit while larger acreages may need a 20-joule rated energizer or larger. It is wise to have more “horsepower” than the minimum because over time fences develop more shorts and extra power is needed to control livestock. The heavier workload for the energizer can also expose other weaknesses. Improper grounding is a common fault discovered when troubleshooting fence systems. A minimum of three ground rods placed 10 feet apart is a requirement and larger energizers will need more ground rods. Train livestock (and wildlife): Livestock need to learn to respect temporary electric fence. Do not place them in a very small temporary paddock during training. Using a polywire to subdivide a large pasture and ensuring that it has ample power (5 kilovolts for cattle) is a great starting point. Livestock can inspect the new item and receive a lesson when they get too close. Allowing space for them to retreat from the polywire is also important. So, too, is visibility, and white polywire seems easier for livestock to see even in low-light conditions. Remember, this is a mental barrier for livestock and they will develop respect for temporary fence in a short time. Small ruminants such as sheep or goats will require multiple strands of polywire for good control. Other options like electric net fence ensures livestock control and provides predator protection. Wildlife will learn to respect a well-energized fence except for rare occasions. Once livestock are trained to polywire, it has numerous uses. For example, many producers will use it to move, sort, construct temporary lanes to gather livestock from large pastures, and exclude livestock from sensitive areas or a storm damaged permanent fence. Don’t abort the mission: Temporary fence is relatively new technology and like all technology it comes with a learning curve. It is important for graziers to attend workshops and develop a support network from educators, producers, and industry representatives who can help them adapt these new tools to their farms. As challenges arise, ask questions and find the solution. Share your experiences with others so they can benefit from your knowledge. There will be points of frustration, but continue to learn and move forward. The producers who have adopted these tools cannot imagine their farm life without them. This article appeared in the February 2018 issue of Hay & Forage Grower on pages 16 and 17.